TRW Automotive supplies the Alfa Romeo 159s standard electronic stability control system, which automatically brakes individual wheels and adjusts throttle to prevent slides and spins. TRWs stability control system also offers two additional features: hill-hold, a function that automatically keeps the brakes applied until the driver gives the right amount of acceleration to start on a slope without rolling backwards; and brake assist, which automatically increases the pressure applied to the brake pedal in the event of an emergency. Alfa Romeo relied upon fellow Fiat subsidiary Magneti Marelli for one of the transmissions in the new lower-premium car. The Selespeed automated manual transmission is an option on the 2.2-liter JTS gasoline version of the 159. 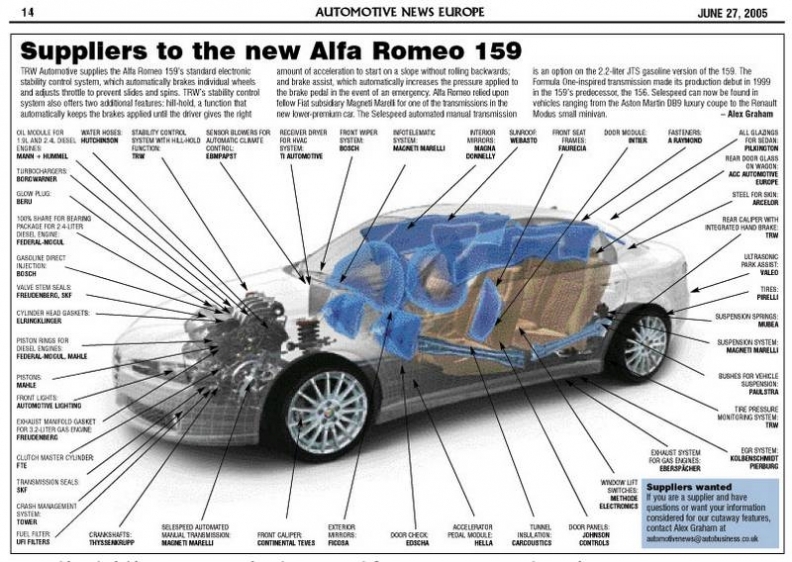 The Formula One-inspired transmission made its production debut in 1999 in the 159s predecessor, the 156. Selespeed can now be found in vehicles ranging from the Aston Martin DB9 luxury coupe to the Renault Modus small minivan.